This is the after. I know, it's just lightbulbs. But this super easy fix made me really happy. Something larger and spherical needed to emerge from those Stature of Liberty torches, and I think the round shapes are pretty. We're going to put clear globes in the upstairs hallway downlight, too, which will look so much better. 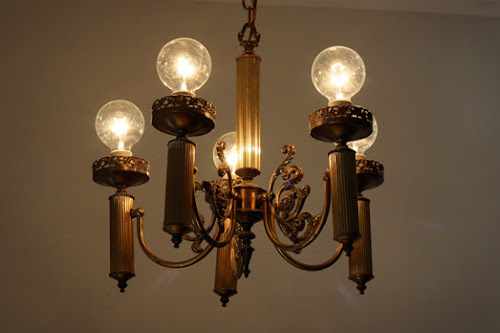 I learned from an anonymous commenter that early light fixtures would have had round, plain, clear bulbs without shades, since electric lights were a status symbol and home owners wanted to show off this fancy new technology. Thank you, knowledgeable commenters! Amazing how such a small thing can make such a huge difference! We had the same issue in our cheaply remodeled SF apartment. It has some victorian elements and an ugly fake gold chandelier with frosted sconces *shudder* I took the sconces off and just added these crystal cut bulbs I got at Lowe's very cheap! I love the change as well. And I really, really love the upstairs chandelier that's your favorite. I'd like to pass along a couple of experiences I had. (You may already know this.) 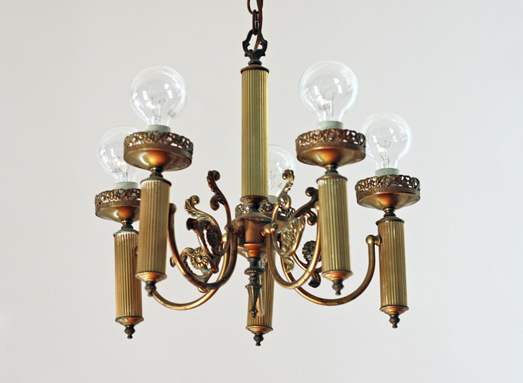 Fixtures with downward-pointing bulbs sometimes have problems: Either the bulbs burn out quickly, or the sockets themselves are damaged and need to be replaced. It's the heat from the bulbs rising to the sockets. 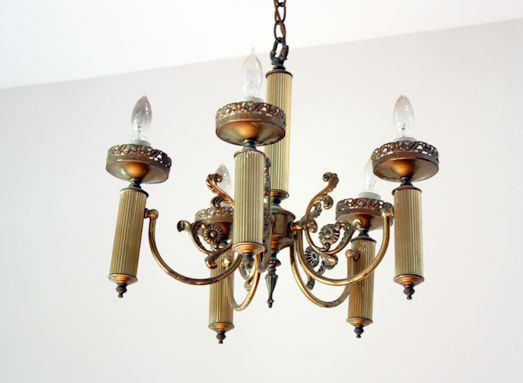 We had a chandelier and a floor lamp with this problem, and learned about it from a master electrician. The solution is to either replace the sockets with ones that can take the heat, or only use bulbs that produce little to no heat, like LEDs or CFL. I love those bulbs! I just used the same ones from Lowes in my new home office chandelier makeover. They make such a difference! You could paint your chandelier orange - I bet it would look stunning. Sarah, your red one is awesome!